Most of the time two or more apps on your phone serve the same purpose such as web browsers, e-book readers and SMS apps. Like most Android users, you might find that downloaded apps from the Market usually work better and offer more features than the ones that came with the phone’s stock OS. You also may have noticed when you first installed the second, and even other similar apps, the phone gives you a choice which app or program to open a specific file with. Usually, whatever app you choose ends up being the default one the next time you open the same file type. But what if – for some reason – you want to reverse that action and go back to when you’re given that prompt to choose again? 1. On your phone, tap on Menu, then go to Settings>Applications>Manage Applications. 2. You should get a list of all your apps. 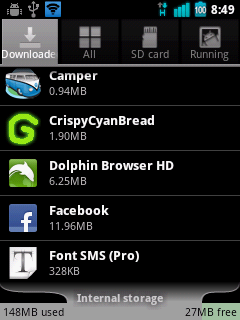 The list might default to show the downloaded apps first. If the app is not showing on the list, it most likely is on the tab labeled All. Tap on the application you want to set as the default. 3. Once you chose the app, scroll down the next window and under the bar that reads: Launch by default, you should see a button that reads Clear defaults – tap on that. 5. You’re done! Hit the back button several times to return to your home screen. Check if the changes were made by opening a file type that is associated with the application – for instance, open a bookmarked website if you’re changing the browser app, or open a PDF file if you’re testing an e-book app. The phone should now ask you which app to open it with this time – just like before. Note: If the “Clear defaults” button is grayed out and you can’t tap on it, most likely that app is currently the default app. Just in case you decide you don’t want to use just one default app, you’ll know where to change the settings. This is also useful when certain apps have different functions and you want to be able to choose the app for every file that you open.